" Blocking peripheral allodynia & hyperalgesia causing significant regional pain reduction "
Algotec's unique PENS therapy is a minimally invasive surgical procedure. 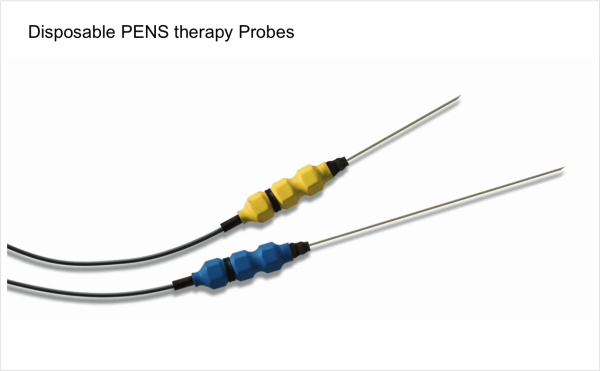 It has evolved from its original intention as a diagnostic tool that could fulfil the need to identify patients more likely to benefit from permanently implanted neuromodulation devices, such as Peripheral Nerve Stimulators (PNS). It is maintained that PENS therapy could reduce the incidence of patients failing to benefit from these invasive, potentially traumatic and costly procedures. It is proposed that endogenous opioid peptides in the central nervous system play an essential role in mediating the analgesic effect of Algotec's PENS therapy and that prolonged pain relief is achieved through the delivery of frequency dependant electrical pulses. Unlike traditional implanted stimulators, Algotec's PENS therapy proposes that eliciting the maximal analgesic effect involves alternating stimulation at high and low frequencies, such that the residual effect of the high frequency stimulation overlaps the low stimulation. Algotec's PENS therapy facilitates the release of specific neuropeptides in the central nervous system, by cycling low frequency stimulation - accelerating the release of enkephalin, b-endorphin and endomorphin and high frequency stimulation - selectively accelerating the release of dynorphin. The combination of these two frequencies produces a simultaneous release of all four opioid peptides resulting in a more effective therapy than stimulation at either one or the other frequency, as is the case with conventional implanted stimulators. Using this method, PENS therapy activates self-healing mechanisms and a normalisation of central processing offering patients the potential for long term management of chronic peripheral neuropathic pain. The effects on receptors and other cellular structures resulting from the application of electrical stimulus have been studied in detail in recent years and the gate control theory and expression of neurotransmitters have been well documented. Since the advent of the “Gate Control Theory” of pain (Melzack and Wall, 1965), electrical stimulation has been delivered via various modalities to induce analgesic effects. In the presence of nociceptive pain, pain messages travel from the periphery via C-fibres (fibres that respond to broad range of painful stimuli) to the dorsal horn at Rexed Lamina 1 & 2 and from there via the spinal thalamic tract to terminate in the sensory cortex. Therefore in these circumstances it is possible to stimulate peripheral inhibitory fibres via Transcutaneous Electrical Nerve Stimulation (TENS) and cause a reduction of pain to the affected body area. 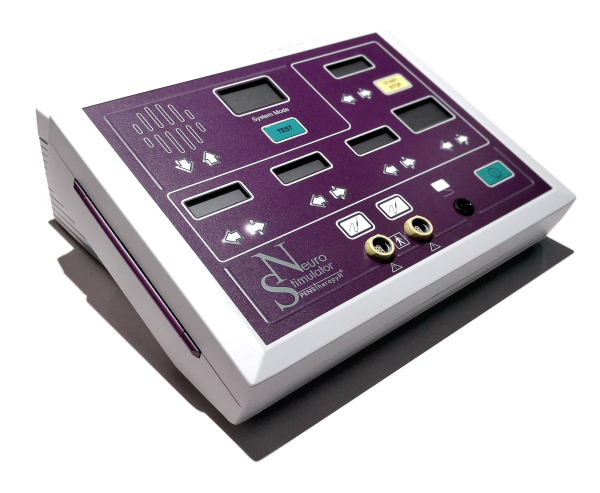 In the case of peripheral neuropathic pain a subset of patients have increased pain in the presence of TENS therapy. In this group of patients C-fibre termination at Rexed Lamina 1 & 2 ceases as a result of peripheral nerve damage and is replaced at Rexed Lamina 1 & 2 by Aβ-fibres. In a patient with neuropathic pain the Aβ-fibres projecting into Rexed Lamina 1 & 2 cause an exaggerated nociceptive response to what are normally innocuous stimuli. These patients are frequently most likely to benefit from PENS therapy. Patients with chronic intractable neuropathic pain often fail to benefit from conventional treatments such as drug therapy and have few options for pain relief.